The atom tag has resurfaced again. I first proposed burnination in April 2017, and I did a mass re-tag when the post reached a score of 100. For a while, atom was gone, but it resurfaced after a short time, as was discussed in BatteryBackupUnit's post from December 2017. I have been monitoring this tag almost daily for months, and it is regularly misused. I just went through my revision history and tallied it up for 2018 year-to-date. Here are the totals I found. I don't believe I am the only one fixing tagging on this, so this likely under-represents the problem. So I put my edit total at 64 so far this year, 74 days into the year (meaning I've edited one post per day on average, 86% of the year to date). It seems clear that this tag is going to keep surviving burnination, as people continue to use it incorrectly, whether atom-editor is tagged already or not. Perhaps we should just explicitly let people know to avoid it by editing it into the tag use guidelines. It currently reads "An atom is a constant whose name is its own value. Some other languages call these symbols" which in my opinion is vague and in no way conveys any relation to atom.io, nor did I find any reference to symbols or constants being called atoms at atom.io. PLEASE DO NOT USE THIS TAG. It has been removed twice already and this guidance comes from a third discussion. 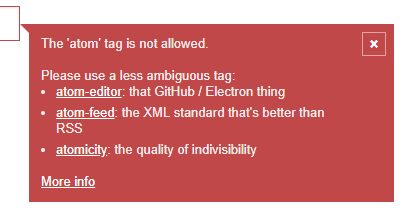 This tag is overly vague and does not fit with the quality standards of Stack Overflow. Not the answer you're looking for? Browse other questions tagged discussion status-completed tag-disambiguation blacklist-request . Why can you suggest an edit that just changes a tag to one of its synonyms?